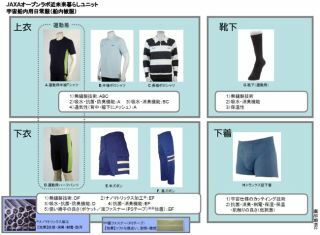 This Japan Aerospace Exploration Agency (JAXA) handout details a variety of space clothing that was tested by Japanese astronaut Takao Doi during the STS-123 shuttle mission in 2009. In an effort to lend a hand to rescue teams on the ground, Japan'sspace agency sent some "space underwear," candies and other Japanesesweets to the 33 trapped miners in Chile, according to news reports. In late September, the Japan Aerospace Exploration Agency sentfive sets of spaceunderwear for each miner, as well as mint candies and other treats, accordingto Kyodo News International. Efforts to evacuatethe mine began Wednesday (Oct. 13), and so far, the rescue team hassuccessfully been able to use a rescue capsule to raise the miners one-by-oneto the surface. The undergarments were intended to help alleviate discomfortfor the individuals in the collapsed mine, where temperatures were reported tohover around 95 degrees Fahrenheit (35 degrees Celsius). The special underwearwas designed to absorb moisture and odor, JAXA officials said. The undergarments are made of the same material worn byJapanese astronaut Naoko Yamazaki earlier this year during a two-week missionto the International Space Station, JAXA officials said. In her firstspaceflight, Yamazaki launched April 5 aboard the space shuttle Discovery.? The high-tech underwear was also tested by Japaneseastronaut Koichi Wakata in 2009 during his 4 1/2-month stay aboard the spacestation. Lucky for his fellow crewmembers, the clothes were able to keep foulodors down in space, and passed a series of extra-long endurance testsduring Wakata's stay on the orbiting outpost. A team of doctors and engineers from NASA traveled to Chilefor a week in early September to provide nutritional advice and psychologicalsupport for the trapped miners. After the small gold and copper mine in northern Chilecollapsed, rescuers were able to dig a 6-inch-wide (15 cm) tunnel to makecontact with the trapped miners. But the rescue mission involved drilling a2-foot-wide (0.6 m) tunnel through 2,200 feet (670 meters) of solid rock ? aneffort that took over two months. The miners had been trapped since Aug. 5. Video - Do Astronauts Stink in Space?